Whipsnade & Studham Circular Walk at Whipsnade Walking RouteTucked away in the south-west corner of Bedfordshire is one of the county's best-kept secrets. The Chiltern Hills offer picture postcard landscapes and stunning views, and have been designated an Area of Outstanding Natural Beauty (AONB). 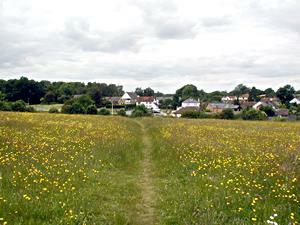 Whipsnade and Studham are typical examples of the area's attractive villages. An intricate network of public footpaths and bridleways bisects each village, offering easy access to the beautiful surrounding countryside. Start/Finish Point: The Whipsnade Tree Cathedral is the suggested starting point for both walks, which are described in a clockwise direction from there. However, you can begin at other points on the route. Start, End Nat GR TL 010 180. Tucked away in the south-west corner of Bedfordshire is one of the county's best-kept secrets. The Chiltern Hills offer picture postcard landscapes and stunning views, and have been designated an Area of Outstanding Natural Beauty (AONB). How to get there by car/parking: Whipsnade is situated on the B4540, about 3 miles south-west of Dunstable. There are carparks at the National Trust's Whipsnade Tree Cathedral in the centre of the village, and at Dunstable Downs, Bison Hill and Whipsnade Heath (walk 1, Whipsnade & Dunstable Downs Circular walk), and a small parking area in Studham village (walk 2, Whipsnade & Studham Circular walk).